1 ESGE suggests using contrast-enhanced computed tomography (CT) as the first-line imaging modality on admission when indicated and up to the 4th week from onset in the absence of contraindications. Magnetic resonance imaging (MRI) may be used instead of CT in patients with contraindications to contrast-enhanced CT, and after the 4th week from onset when invasive intervention is considered because the contents (liquid vs. solid) of pancreatic collections are better characterized by MRI and evaluation of pancreatic duct integrity is possible. 2 ESGE recommends against routine percutaneous fine needle aspiration (FNA) of (peri)pancreatic collections. Strong recommendation, moderate quality evidence. FNA should be performed only if there is suspicion of infection and clinical/imaging signs are unclear. 3 ESGE recommends initial goal-directed intravenous fluid therapy with Ringer’s lactate (e. g. 5 – 10 mL/kg/h) at onset. Fluid requirements should be patient-tailored and reassessed at frequent intervals. 4 ESGE recommends against antibiotic or probiotic prophylaxis of infectious complications in acute necrotizing pancreatitis. Strong recommendation, high quality evidence. 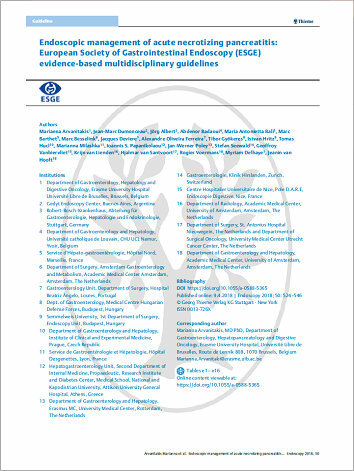 5 ESGE recommends invasive intervention for patients with acute necrotizing pancreatitis and clinically suspected or proven infected necrosis. Strong recommendation, low quality evidence. ESGE suggests that the first intervention for infected necrosis should be delayed for 4 weeks if tolerated by the patient. 6 ESGE recommends performing endoscopic or percutaneous drainage of (suspected) infected walled-off necrosis as the first interventional method, taking into account the location of the walled-off necrosis and local expertise. 7 ESGE suggests that, in the absence of improvement following endoscopic transmural drainage of walled-off necrosis, endoscopic necrosectomy or minimally invasive surgery (if percutaneous drainage has already been performed) is to be preferred over open surgery as the next therapeutic step, taking into account the location of the walled-off necrosis and local expertise. 8 ESGE recommends long-term indwelling of transluminal plastic stents in patients with disconnected pancreatic duct syndrome. Lumen-apposing metal stents should be retrieved within 4 weeks to avoid stent-related adverse effects.